Looking for some tasty school lunchbox inspiration? These mini-muffins are quick, easy and delicious! School lunches can get very boring, very fast. Parents everywhere are on a constant crusade to find fresh, new snack ideas to pop into the kids school lunches. Mini-muffins are quick, easy and freeze well so they can be made ahead of time are ready to go each morning. This recipe is a kid favourite and gets much of its sweetness from a ripe banana and splash of apple juice. Adding extras like walnuts or raisins ups the fibre, protein and taste. Get the kids to help out with the recipe! 1. Preheat oven to 180C/350F. Line mini muffin pan with muffin liners. 2. Mix all wet ingredients together, including banana and apple. 3. Add flour, sugar and baking powder and fold until just combined. 4. Fill muffin liners using a regular tablespoon to get 24 mini-muffins. 5. Bake for 12-15 minutes, or until muffins are just firm to the touch and lightly golden brown on top. 6. Allow to cool on cooling rack. If freezing, wait until muffins are completely cool, and place on a cookie tray in the freezer. Once frozen, muffins can be kept in a freezer-proof bag and won't stick together. 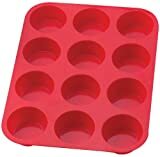 Silicone Muffin Trays--Non-stick and Quick Clean! Can I Make Additions or Substitutions to This Recipe? Gluten-free? Sugar-free? Fat-free? Go for it! Yes, you can change this recipe to suit your dietary needs without compromising on flavour or texture. For gluten-free, simply substitute the all-purpose flour for rice or gluten-free flour, or a mixture of both. If you are interested in using quinoa flour, remember it is a dense, moist flour with a strong flavour--only substitute a small amount, between 1/4 and 1/2 cup. Almond flour also has a dense texture, so a small substitution would work best. 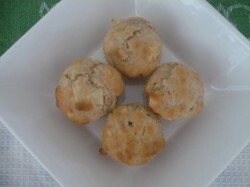 For sugar-free muffins, omit the sugar and add another banana with 1/4 cup of baking stevia. Sweetness is often to taste--some people adore very sweet foods, where others only need the sweetness of a fruit--so you may need to experiment with the degree of sweetness that best agrees with you and your family. For fat-free muffins, you can omit the canola oil and substitute for apple sauce. However, this often changes the texture and can make the muffins spongy. Again, some palates are happy with springy muffins, while others enjoy a more cake-like texture, which the use of oils provide. To strike a balance, consider just reducing the amount of oil and topping up with applesauce. There are many extras you can add to these muffins--chopped walnuts, chopped macadamias, sunflower seeds, raisins, dried cranberries and chocolate chips to name but a few. Use your imagination, and whatever is taking up space in your pantry, and experiment with different flavours. Do You Prefer Muffins or Cupcakes? Fruity muffins take the cake? Or indulgent cupcakes all the way? I love me some fruity muffins! Adore the sweet sinfulness of a frosted cupcake! Muffin? Cupcake? You can keep 'em both--I don't care for sweets! Banana, apple, and cinnamon and always great together! Such a tasty and healthy snack, as Tolovaj says. These always go down well--and I love having frozen muffins on hand for visitors--makes life much easier than baking fresh at a moments notice! Tasty and healthy => my favorite combination! Kids need to eat vegetables. Kids don't like eating vegetables. Here is a vegetable packed, nutritious and tasty soup recipe your kids will love for any week night dinner.